Have you ever felt you know someone already, even though you only just met? Maybe you knew them in another life. Lucy and David, who live in modern Dublin (Ireland), first knew each other in ancient Crete. They had a baby girl, but disaster struck, and their guardian angels have been trying to reunite the little family for 4,000 years. Regression therapists might like to recommend this book to the sceptical, even though real guides are more effective than these ones; or at least we hope so. Although some who read it will be encouraged to investigate the idea further, this story can and has also been enjoyed simply as a piece of fiction. 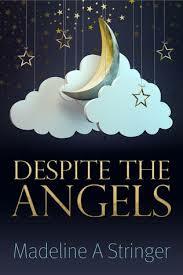 Despite the Angels can be found on Amazon at http://authl.it/h8 or by looking up its title or the author’s name. It is available for download or as a paperback.